Most in the United States likely associate the concept of the child bride with the mores and practices of the distant past. But Nicholas L. Syrett challenges this assumption in his sweeping and sometimes shocking history of youthful marriage in America. Focusing on young women and girls–the most common underage spouses–Syrett tracks the marital history of American minors from the colonial period to the present, chronicling the debates and moral panics related to these unions. Although the frequency of child marriages has declined since the early twentieth century, Syrett reveals that the practice was historically far more widespread in the United States than is commonly thought. It also continues to this day: current estimates indicate that 9 percent of living American women were married before turning eighteen. 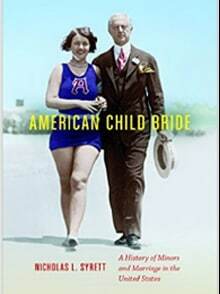 By examining the legal and social forces that have worked to curtail early marriage in America–including the efforts of women’s rights activists, advocates for children’s rights, and social workers–Syrett sheds new light on the American public’s perceptions of young people marrying and the ways that individuals and communities challenged the complex legalities and cultural norms brought to the fore when underage citizens, by choice or coercion, became husband and wife.